Wells Fargo delivered business by the fastest means possible whether it was by stagecoach, steamship, railroad, pony rides or telegraph. In 1858, Wells Fargo helped start the Overland Mail Company — the famed “Butterfield Line” — to meet the demand for speedy communications across the west. In 1861, Wells Fargo also took over operations of the western leg of the famed, but short-lived, Pony Express. In 1866, Wells Fargo combined all the major western stage lines. Stagecoaches bearing the name Wells, Fargo & Co. rolled over 3,000 miles of territory, from California to Nebraska, and from Colorado into the mining regions of Montana and Idaho. After the completion of the transcontinental railroad in 1869, Wells Fargo increasingly rode the rails. In 1888, after expanding along the new steel network across the Northeast into New York, Wells Fargo became the country’s first nationwide express company. It adopted the motto “Ocean-to-Ocean” to describe its service that connected over 2,500 communities in 25 states, and “Over-the-Seas” to highlight its lines linking America’s increasingly global economy. Wells Fargo rushed customers’ business from the urban centers of New York and New Jersey, through the rail hub of Chicago and farming regions of the Midwest, to ranching and mining centers in Texas and Arizona, and to lumber mill towns in the Pacific Northwest. Wells Fargo agents in towns large and small offered basic financial services like money orders, travelers checks, and transfer of funds by telegraph. Always, though, wherever there was mining, from Alaska to Arizona, Wells Fargo guarded the gold. By 1910 the Company’s network linked 6,000 locations, including new offices in the Upper Midwest and Great Lakes regions. It was in these towns that the famed “Wells Fargo Wagon” delivered goods of all sorts, from a grey mackinaw to some grapefruit from Tampa, as the song from the Music Man goes. By 1918 Wells Fargo was part of 10,000 communities across the country. That year, however, the federal government took over the nation’s express network as part of its effort in the First World War. Wells Fargo was left with just one bank in San Francisco. The famous image of the stagecoach and the reputation of the name saw Wells Fargo well through the mighty events and fantastic growth of the 20th Century. In prosperity, depression and war, even greater post-war prosperity, social changes and ever faster communications technologies, Wells Fargo’s attention to customers’ business has seen it through these great events and brought success. In 1905 Wells Fargo & Co’s Bank, San Francisco (as it was called since 1852), formally separated from Wells Fargo & Co Express. 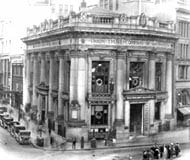 The bank then survived the disaster of the 1906 San Francisco earthquake and fire. Bank president I.W. Hellman telegraphed, “Building Destroyed, Vault Intact, Credit Unaffected.” From that confident note, Wells Fargo began rebuilding its banking business across the West. In the 1910s and 1920s, Wells Fargo served as a commercial bank in San Francisco, supporting the West’s growing business and agriculture, including fledgling auto, aerospace and film industries. The Wells Fargo Stagecoach became a regular actor in Hollywood westerns. Sound management helped the bank weather the Great Depression, serve the nation during World War II, and positioned the bank to meet new consumer banking needs in the prosperous post-war era. New banking concepts not only changed where people banked, but how they banked. Drive-up tellers, banking by phone, express lines, credit cards, automated teller machines, and online banking are some of the innovative solutions to modern customers’ needs. As in the stagecoach days, Wells Fargo has been a pioneer in bringing banking convenience to its customers. Through the 20th Century Wells Fargo rebuilt from just one office in San Francisco. From 1905 to 1923 it was a premier downtown San Francisco institution. Expanding in 1923 to two marbled banking halls, Wells Fargo was a “banker’s bank” that served the entire west. In 1960s prosperity, Wells Fargo became a northern California regional bank with branch offices everywhere people lived and played, from the coast to the mountains. In the 1980s Wells Fargo expanded into a state-wide bank and became the seventh largest bank in the nation — and launched its online service. In the 1990s Wells Fargo returned to its historic territory throughout the Western, Midwestern, and Eastern states. In the great enterprise of building reliable transcontinental transportation, we came to own and operate the largest stagecoach empire in the world. Learn more about the iconic symbol that is Wells Fargo.